Spencer Tracy in Dr. Jekyll and Mr. Hyde. 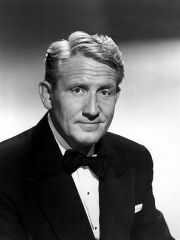 Spencer Tracy (April 5, 1900 – June 10, 1967) was a two-time Academy Award-winning American film and stage actor who appeared in 74 films from 1930 to 1967. As an actor, Tracy was ahead of his time. He was believable as the character he was playing. In his films, the work of others seems outdated. Tracy was conversely able to morph into multiple personas regardless of the characterization his role called for. Tracy is generally regarded as one of the finest actors in motion picture history. In 1999, the American Film Institute named Tracy among the Greatest Male Stars of All Time, ranking 9th on the list of 100. He was nominated for nine Academy Awards for Best Actor. He was linked to actress Katharine Hepburn during his career, but the details of their relationship are cloudy. Tracy was born in Milwaukee, Wisconsin, the second son of John Edward Tracy, an Irish American Catholic truck salesman, and Caroline Brown, a Protestant turned Christian Scientist, and was christened Spencer Bonaventure Tracy. Tracy's paternal grandparents, John Tracy and Mary Guhin, were born in Ireland. His mother's ancestry dates back to Thomas Stebbins, who immigrated from England in the late 1630s. Tracy attended six high schools, starting with Wauwatosa High School in 1915, and St. John's Cathedral School for boys in Milwaukee the following year. The Tracy family then moved to Kansas City, where Spencer was enrolled at St. Mary's College, Kansas, a boarding school in St. Marys, Kansas, 30 miles west of Topeka, Kansas, then transferred to Rockhurst, a Jesuit academy in Kansas City, Missouri. John Tracy's job in Kansas City did not work out, and the family returned to Milwaukee six months after their departure. Spencer was enrolled at Marquette Academy, another Jesuit school, where he met fellow actor Pat O'Brien. The two left school in spring 1917, to enlist in the Navy with the American entry into World War I, but Tracy remained in Norfolk Navy Yard, Virginia, throughout the war. Afterwards, Tracy continued his high school education at Northwestern Military and Naval Academy in Lake Geneva, Wisconsin, but finished his studies at Milwaukee's West Division High School (now Milwaukee High School of the Arts) in February 1921. Afterward he attended Ripon College where he appeared in a leading role in a play entitled The Truth, and decided on acting as a career. Tracy received an honorary degree from Ripon College in 1940. While touring the Northeast with the Ripon debate team, he auditioned for and was accepted to the American Academy of Dramatic Arts in New York. Tracy's first Broadway role was as a robot in Karel Čapek's R.U.R. (1922), followed by five other Broadway plays in the 1920s. In 1923, he married actress Louise Treadwell. They had two children, John and Louise (Susie). For several years he performed in stock in Michigan, Canada, and Ohio. Finally in 1930, he appeared in a hit play on Broadway, The Last Mile. Director John Ford saw Tracy in The Last Mile and signed him to do Up the River for Fox Pictures. Shortly after that, he and his family moved to Hollywood, where he made over twenty-five films in five years. In 1935, Tracy signed with Metro Goldwyn Mayer. He won the Academy Award for Best Actor two years in a row, for Captains Courageous (1937) and Boys Town (1938). He was also nominated for San Francisco (1936), Father of the Bride (1950), Bad Day at Black Rock (1955), The Old Man and the Sea (1958), Inherit the Wind (1960), Judgment at Nuremberg (1961), and posthumously for Guess Who's Coming to Dinner (1967). Tracy and Laurence Olivier share the record for the most Academy Best Actor nods with nine Oscar nominations. In 1941, Tracy began a relationship with Katharine Hepburn, whose agile mind, sleek elegance, and New England brogue complemented Tracy's easy working-class machismo very well. Their relationship, which neither would discuss publicly, lasted until Tracy's death in 1967. Whether the two stars were close friends and kindred spirits, or had a sexual affair, is still a matter of speculation. Though estranged from his wife, Louise, Tracy was a practicing Roman Catholic and never divorced. He and Hepburn made nine films together. Seventeen days after filming had completed on his last film, Guess Who's Coming to Dinner, with Hepburn, he died from heart failure at the age of 67. Forty years after his death, Tracy is still widely considered one of the most skillful actors of his time. He could portray the hero, the villain, or the comedian, and make the audience believe he truly was the character he played. In the 1944 film, The Seventh Cross, for example, he was effective as an escaped prisoner from a German concentration camp despite his heavy-set build. Tracy was one of Hollywood's earliest "realistic" actors; his performances have stood the test of time. Actors have noted that Tracy's work in 1930s films sometimes looks like a modern actor interacting with the more stylized and dated performances of everyone around him. In 1988, the University of California, Los Angeles' Campus Events Commission and Susie Tracy created the UCLA Spencer Tracy Award. The award has been given to actors in recognition for their achievement in film acting. Past recipients include William Hurt, James Stewart, Michael Douglas, Denzel Washington, Tom Hanks, Sir Anthony Hopkins, Jodie Foster, Harrison Ford, Anjelica Houston, Nicolas Cage, Kirk Douglas, Jack Lemmon, and Morgan Freeman. On Gene Tierney: "Although she was beautiful in her films, they couldn't quite capture all of her. Fortunately, I did even if it was late in my life." On drinking: "Hell, I used to take two-week lunch hours!" "I couldn't be a director because I couldn't put up with the actors. I don't have the patience. Why, I'd probably kill the actors. Not to mention some of the beautiful actresses." "I'm disappointed in acting as a craft. I want everything to go back to Orson Welles and fake noses and changing your voice. It's become so much about personality." Fellow actor Van Johnson referred to Tracy as "my mentor." After Johnson was involved in a serious car accident prior to filming A Guy Named Joe, both Tracy and Irene Dunne petitioned the MGM studio heads to wait for Johnson to recuperate, rather than replace him. Tracy had a brief romance with Gene Tierney while filming Plymouth Adventure. He was a distant cousin to Gabrielle Christian, star of South of Nowhere. She ironically plays a character named Spencer. ↑ David A.Y.O. Chang, "Spencer Tracy's Boyhood: Truth, Fiction, and Hollywood Dreams," Wisconsin Magazine of History 81, no. 1 (2000): 30-35. ↑ Ripon College Archives, Spencer Tracy. Retrieved May 30, 2007. Acta Sanctae Sedis, 33, (1901): 550. Chang, David A.Y.O. "Spencer Tracy's Boyhood: Truth, Fiction, and Hollywood Dreams." Wisconsin Magazine of History 81, no. 1 (2000): 30-35. Ripon College Archives. Spencer Tracy. Retrieved May 30, 2007. Swindell, Larry. 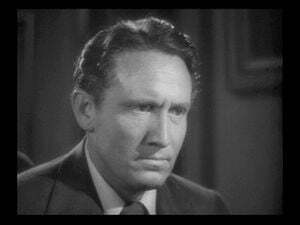 Spencer Tracy; a Biography. New York: World Pub. Co., 1969. This page was last modified on 20 October 2015, at 23:04.